Whether or not you know Yoji Shinkawa from Kojima Productions by name, you almost certainly know him by his work. The venerable character artist has created some of the most striking and iconic artwork to be featured in games, most notably across the Metal Gear Solid series starting all the way back in 1998. Shinkawa-san’s newest project is a collaboration with Square Enix on Left Alive, a new survival action shooter set in the Front Mission universe that launches 5th March on PS4. 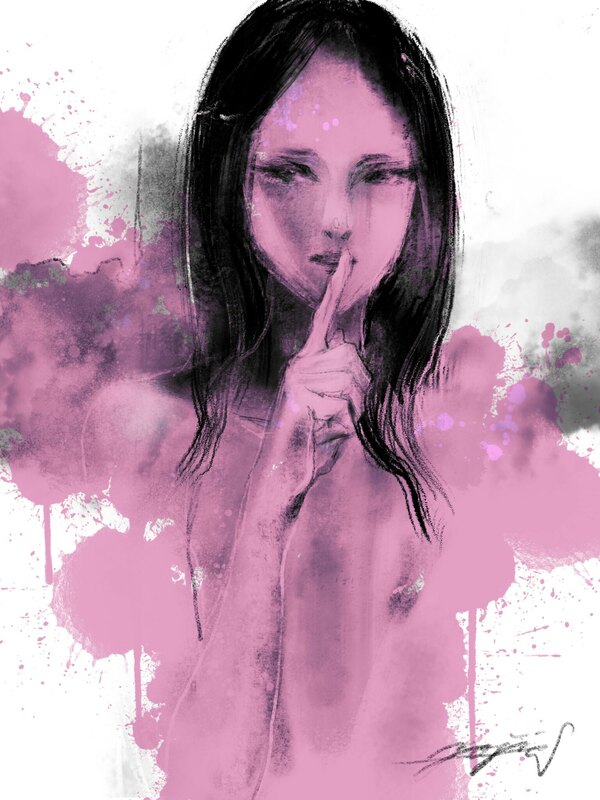 We reached out to Shinkawa-san to learn more about the intricacies of his creative process, what this new collaboration looked like from his perspective, and whether he’s embraced a digital workflow or prefers to stick to his pen-and-paper roots. As a special bonus, he’s provided a start-to-finish recording of one of his most recent works, which you can watch here. Enjoy. How do you go about starting a new artistic project? What’s step one? 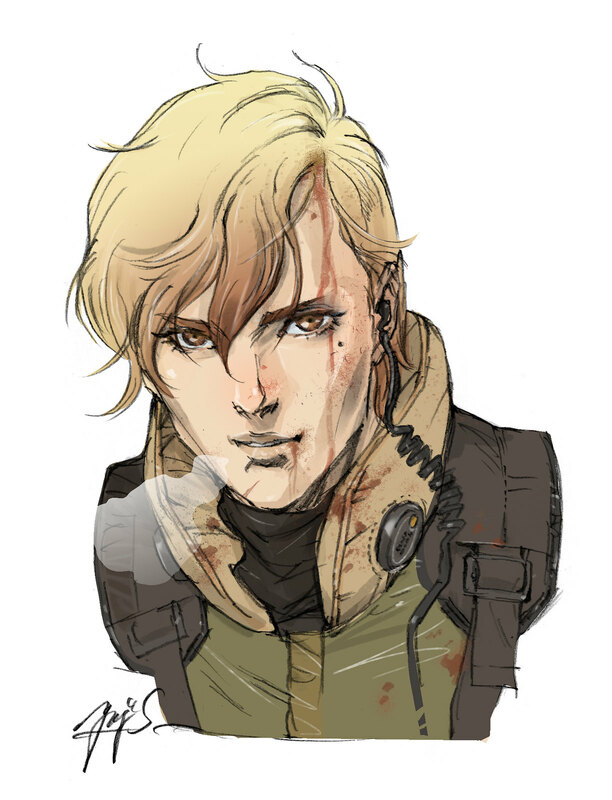 Can you tell us about the creative brief you received for Left Alive, and how you approached it from there? 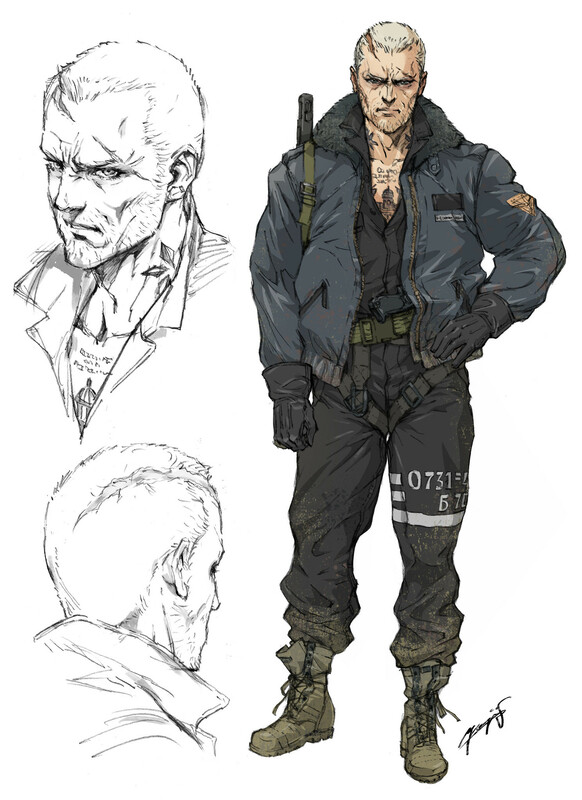 Shinkawa: Initially, the request was to design the three main characters, and I received information on their gender along with a simple profile. From there, I started by submitting a few rough images for Leonid, a type of character I’m accustomed to drawing; I then proceeded with designing, while also checking on the direction and maintaining balance with the other characters. Your style is iconic and immediately recognisable. How much experimenting do you do with other styles or tools outside your comfort zone? Shinkawa: As far as work-related projects, there isn’t much experimentation; but outside of work, I recently got a new iPad, so I’ve been using the pen to directly draw on the device. Following up on that last question, are there any examples of personal work that wasn’t attached to a project, which you’d be willing to share with us here? 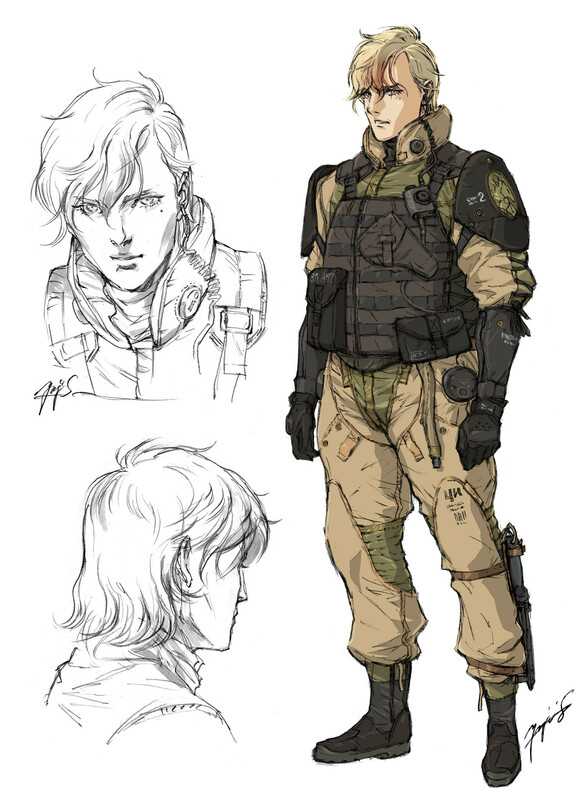 Shinkawa: Late last year, I had the opportunity to speak with Mr. Yusuke Naora (IZM designworks), who also known for his work on the Front Mission series, during an interview with a magazine. His birthday happened to be close, so I sent him an illustration I drew on the aforementioned iPad, kind of like a birthday message. What are your thoughts on the rise of digital art? Have you shifted to a digital workflow, or do you still work in a physical medium and scan your creations in from there? Shinkawa: Fundamentally, my approach hasn’t changed – I draw the designs on paper with a pencil or brush pen, scan the designs and then make adjustments in Photoshop. There are some instances where I draw things digitally from the start, but I don’t think I will transition completely to that medium. What does your creative toolkit look like? 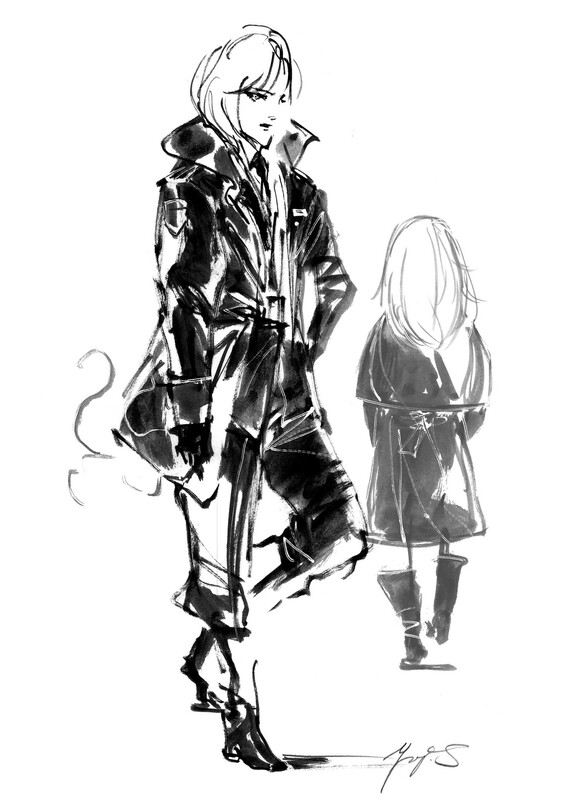 Shinkawa: It contains A4 copy paper, pencil, eraser, brush pen, correction pen, and Photoshop. 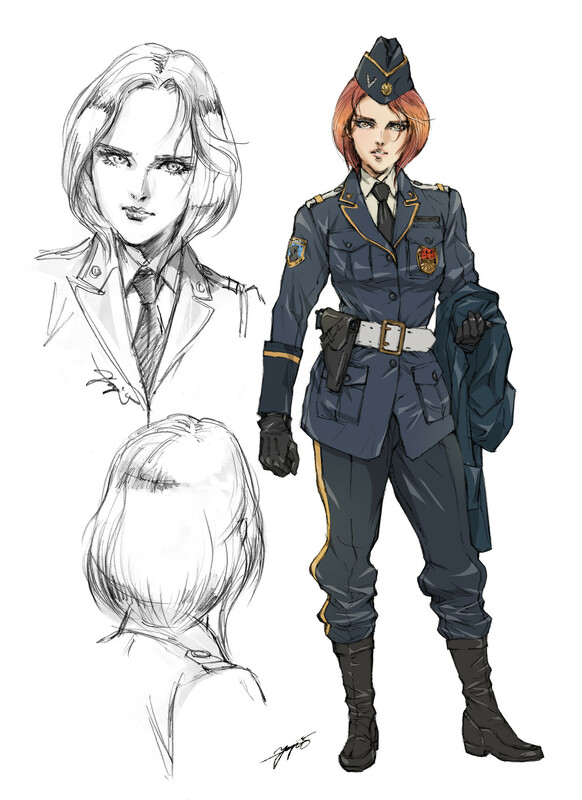 What has been your involvement in Left Alive? How are you working in tandem with the rest of the team on the project? Shinkawa: I took on the character designs for the three main characters and created the image for some of the other key characters in the game. In terms of mechs, I designed one of the Wanzer models. Aside from this, I also reviewed a set of the in-game models and their motion. The general flow entailed providing feedback on areas that needed to be addressed upon reviewing the designs and models, and communicating back and forth with the team. Left Alive feels like a much more human story. Were you tasked with creating non-mech designs as well as the Wanzers that we’ve seen so far? Were there any particular challenges that came from balancing the two? Shinkawa: I wasn’t involved with arranging the design for the previous Zenith-type Wanzers, which are a staple of the series. But I had been given the opportunity to design a Wanzer, which was meant to be a completely new model. As such, I didn’t need to get caught up in the lineage or style of existing Wanzers. The request was for something that appeared powerful/formidable, so I went about freely designing this mech. How much does gameplay affect the creation process? Do you ever design around a specific gameplay mechanic, or are the designs created long before the game is in a playable state? 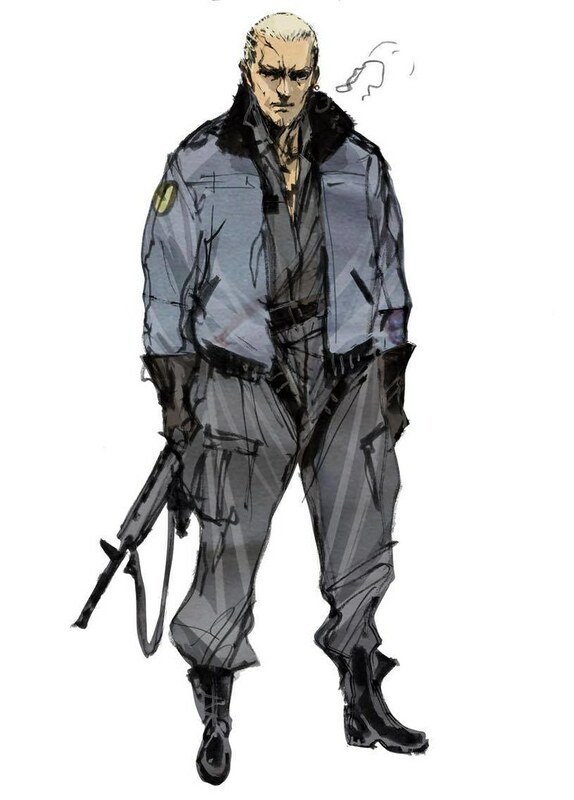 Shinkawa: The designs were generally completed before the game could be test played, but some issues or inconveniences, such as placement of equipped items and the appearance of detailed features, arise when you actually move the character around in-game. In such cases, I would make adjustments upon discussing with the production team. Is there much iteration when it comes to fleshing out character designs? How much back and forth do you usually go through before a design is actually finished? Shinkawa: For this project, each character’s backstory and attributes were clearly defined, so it was relatively easy to solidify. As I submitted rough sketches or detailed character settings, I would receive feedback from the producer Mr. Shinji Hashimoto and director Mr. Toshifumi Nabeshima, make adjustments, and brush up the designs – I recall this back and forth occurred roughly three to four times per character. The post How revered Metal Gear Solid artist Yoji Shinkawa defined new survival shooter Left Alive’s distinctive look appeared first on PlayStation.Blog.Europe.